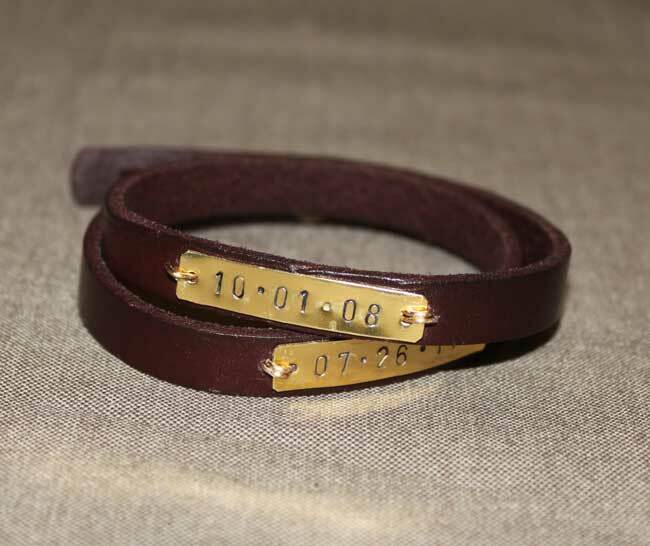 Make a metal stamped leather wrap bracelet using special dates like kids birth dates, spouses birth dates, an anniversary or other dates you want to commemorate. This might be one of my all time favorite gifts that I’ve ever made! I’m sure that won’t be the last time I say that, but this one will probably be tops for a while. 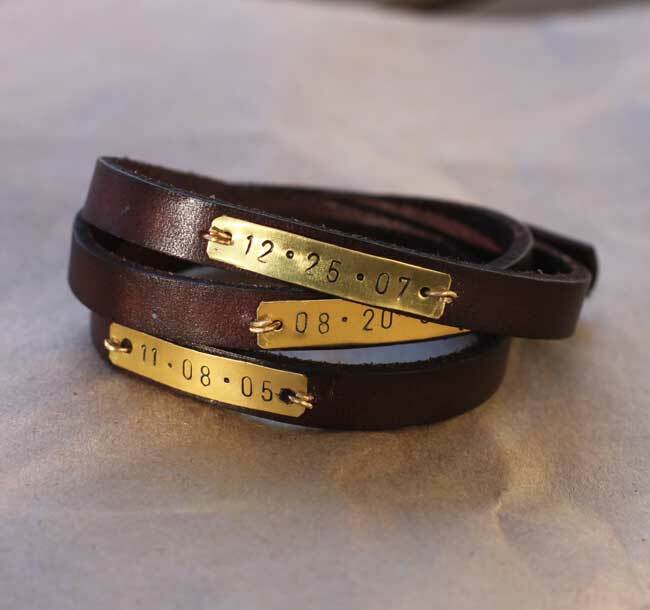 I had been wanting to try a metal stamping project for a long time, and we all know I love wrap bracelets and personalized gifts, so this metal stamped leather wrap bracelet using kids birth dates was a perfect combination. The first one I made was for my sister-in-law and then I made a few for some people on my team at work. I had collected some of the tools over several months. 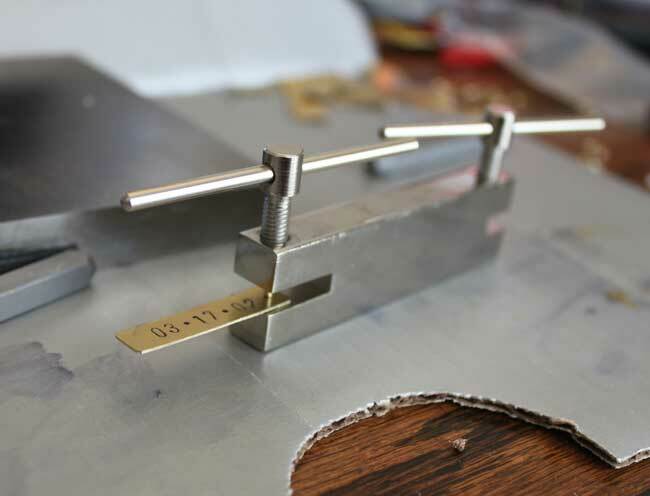 I won’t attempt to write full a metal stamping tutorial as there are people out there with much more experience that can guide you through. One tutorial I used to get started was from Happy Hour Projects. *Some supplies links may be linking to affiliate links on amazon.com and other trusted retailers. 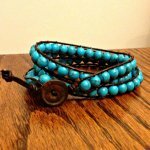 Leather wrap bracelet (I used double and triple wrap styles). Metal stamping set with numbers, I also used a period sign from a basic punctuation set. First I cut small rectangles from my metal sheets. I cut them approximately the same width of my bracelet figuring I’d cut them down a bit after I stamped them. For length it was purely trial and error based on the size of my metal stamped numbers. 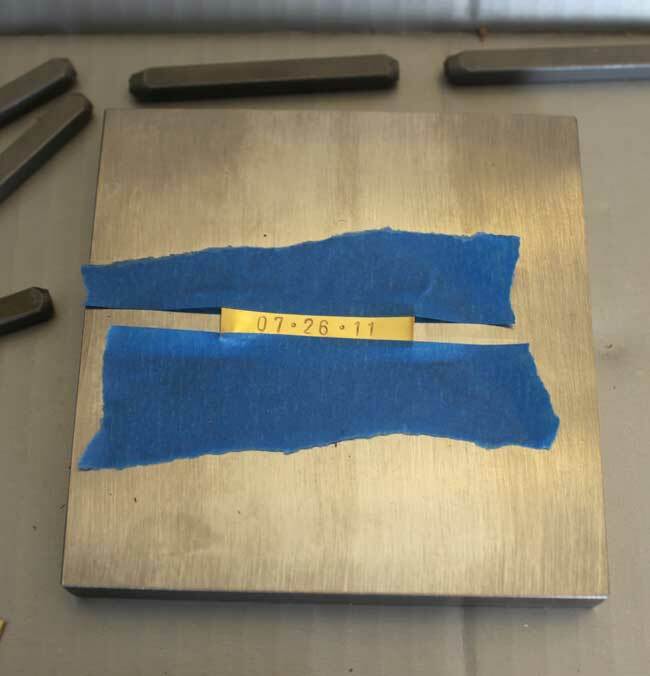 I taped down my metal piece to the steel bench block and stamped the month date and year of the child’s birthday with a period between each set of numbers. To darken the dates, I used a Sharpie marker and then rubbed it off gently with a cotton cloth with rubbing alcohol on it. This leaves the numbers darkened but not the rest of the metal. After that I put a hole in each end of each of the metal rectangles so that I could attach them to the leather wrap bracelet. 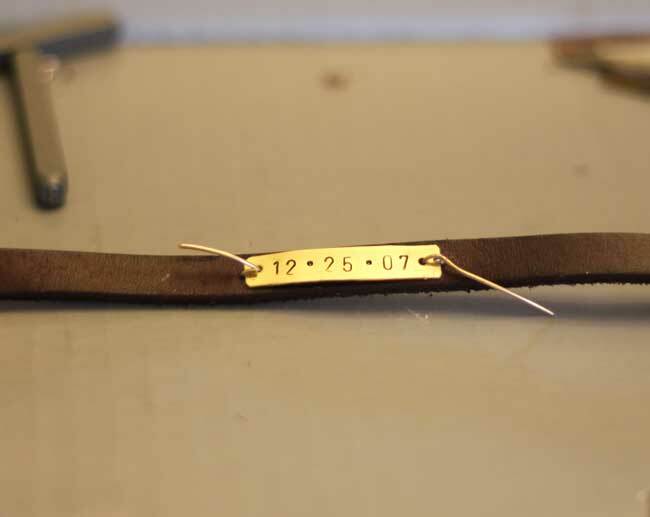 Then I created the holes in the the leather wrap bracelet, two for each hole on the metal stamped rectangle. This took a bit of measuring against my wrist to decide where I wanted the metal rectangles and then where to place the holes. Originally I thought I was going to use jump rings to fasten my stamped metal rectangles to the leather wrap bracelet, but after a few attempts, I gave up. I bought some 20 guage wire and looped it through each hole and then overlapped them on top. Finally I trimmed the wire and tried to make sure it was as smooth as possible so it wouldn’t catch on things. I’m so happy with how they turned out. They are a little imperfect looking which is part of what I love about them – varying darkness of the numbers and some are a little uneven. Here’s the triple wrap bracelet I made for my sister-in-law. Then I made some double wrap bracelets for a few people on my team, some in gold and some in silver. 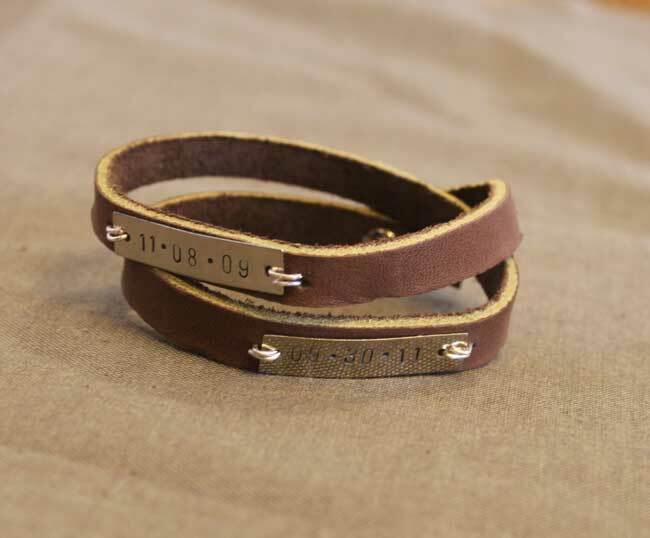 I’m thinking of making another one for a friend and one for myself using a phrase instead of birth dates which were my original inspiration from the site Bourbon and Boots. I’m pretty excited about doing those, I just need to figure out what sayings i want to use. These are great! There is so much inspiration out there and I love the ones with words. I have 3 cuffs with different words or phrases on them ~ you are braver than I ~ I will leave this one to the professionals! I’ve seen you post pictures of her stuff before – it’s lovely! Oh this is lovely. I don’t have any of the stuff to make this but I can always start a wish list. I love personalised anything, especially jewellery. Thanks. Thanks for visiting! I got my supplies periodically over a few months. I use a regular hammer and not a specialty one. It was much simpler than I expected it to be. Your bracelet came out lovely! What did you find is the best way to make holes in the leather? Thank you! I actually used the same tool that I used to do the holes in the metal. It worked just fine. Long term if I were going to do more leather work, I’d buy a leather punch, but since I was only making a few bracelets, I didn’t want to buy another tool. You could also probably get by with a small nail and hammer. Thanks for answering my question, Erin! I’ll give the nail & hammer a try! 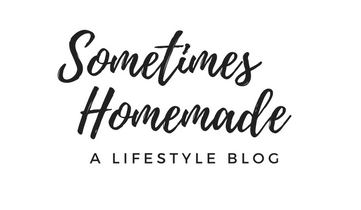 Saw you over at DIY Show Off Party – I love these! What a great gift. Love them!! Do you do special ordered ones? Hi Kathy – thank you! I’m purely a hobbyist and not a seller. I’m sure there are some great Etsy sellers out there who would make something similar. Thanks, for info!! Let the hunt begin!! Hi Erin , I love your bracelets. Do you think that you would make one for me and my daughter. If so how much would you charge me? Hi Sondra – thanks for reaching out. I’m just a hobbyist and not a seller. I would suggest checking in Etsy. There are a lot of sellers who do metal stamping and leather work. Good luck! Hi I’m really interested in trying out some mental stamping i have the letter stamping kit but im unsure what kind of metal sheet to buy where did you get yours from and what kind of metal is it? Thanks for you help they look beautiful! I got mine at Michael’s. They sell both sheets you can cut yourself as well as pre-cut shapes of varying sizes. I believe their brand is Bead Landing. I’m not sure what kind of project you’re planning to do, but if they make a pre-cut size that works for you, it makes it so much easier. 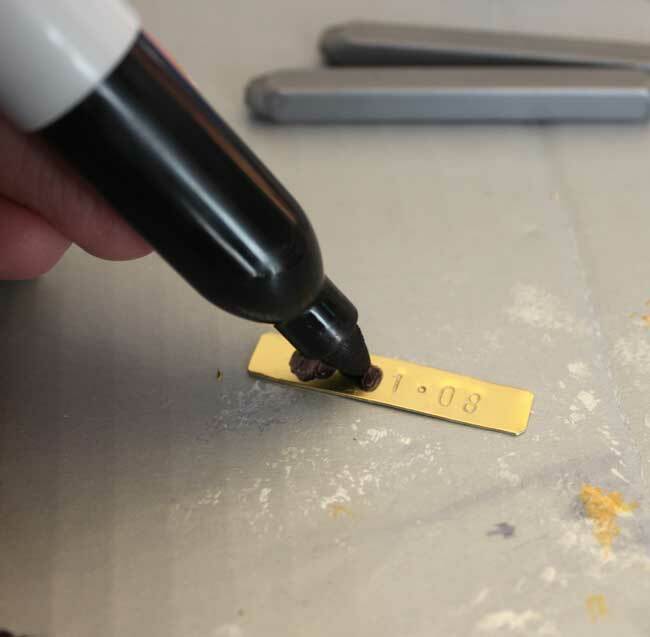 Start with something fairly inexpensive, you’ll need to do some practice rounds to get the hang of metal stamping (how hard to hit the hammer, how to make the letters even, etc.). Good luck! 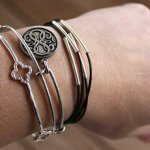 I love this and I know my girls would too! 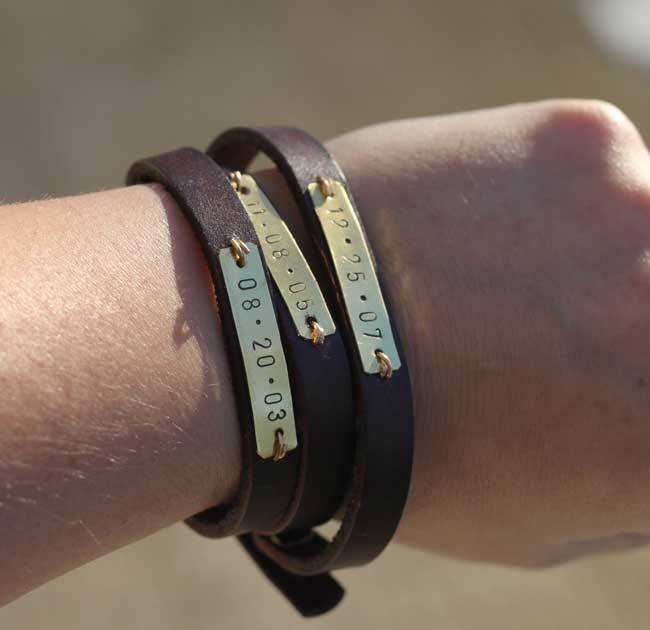 Can you tell me where to get the leather wrapped bracelets? Thanks so much! Hi Michelle – I’ve bought some at JoAnn’s and then some off of Amazon. I also made one using some scrap leather I bought at Michael’s which was a lot more challenging, but still turned out great. 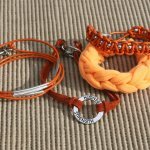 Hi Diane – for some of these I used a plain leather bracelet from Michael’s craft store that already had a hitch post fastener. 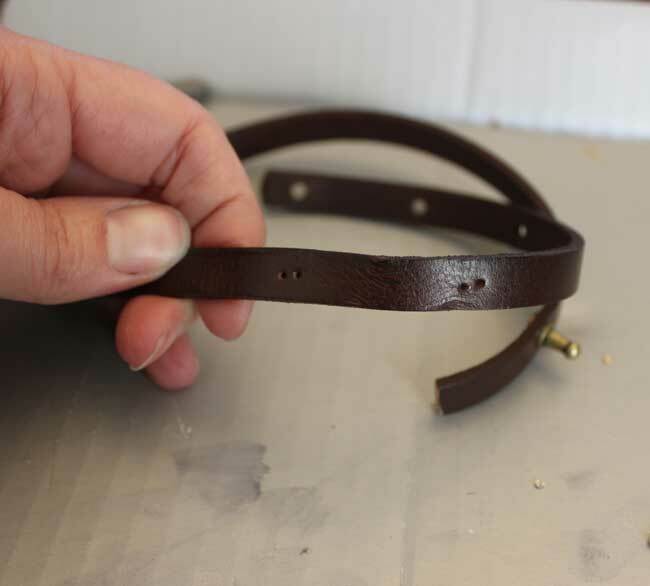 I recently did a tutorial for another leather bracelet though where I used the same type of hitch fastener but attached it myself. Here’s the link to that post. And here’s the link to the hitch fastener’s I bought from amazon. How do I order one and how much are they ? Hi Chip – I don’t sell these, I’m just a hobbyist crafter. I would do a search on etsy.com to find someone there to make one for you. I wish you sold these – they are beautiful and exactly what I’m looking for!